If you would like to add content for real change of society (not status quo content) just click on the edit button below on the page you want to add to. Don't forget to save when you are finished. If you want your own private page: no sweat, just type a name for it in the "create a new page" box on the left sidebar and you will be off and running with a new blank page. Don't forget to save it as well! Have fun. There seem to be a number of suspicious involvements of Bush family members with National/World tragedy events. Note: This page is not finished. Unless a link is given as to where posted on the internet, there is no source known beyond opinion or rumor. George Herbert Walker: (banking side of family) Financed shadowy organizations and businesses including war profiteering. http://en.wikipedia.org/wiki/George_Herbert_Walker wikpedia on 10/27/09. In 1920, Walker became the President of the W.A. Harriman & Co. investment firm, and quickly arranged the credits that Averell Harriman needed to take control of the Hamburg-Amerika Line. Walker also organized the American Ship and Commerce Corp. to be subsidiary of the W.A. Harriman & Co., with contractual power over the affairs of the Hamburg-Amerika. W.A. Harriman & Co. (renamed Harriman Brothers & Company in 1927) well-positioned for this enterprise and rich in assets from their German and Russian business, merged with the British-American investment house Brown Bros. & Co. on January 1, 1931. Walker retired to his own G.H. Walker & Co. This left the Harriman brothers, his son-in-law Prescott Bush and Thatcher M. Brown as senior partners of the new firm of Brown Brothers Harriman & Co. The firm's London branch continued operating under its historic name Brown, Shipley & Co.
JFK was turning peaceful, while the CIA was turning militant and aggressive. 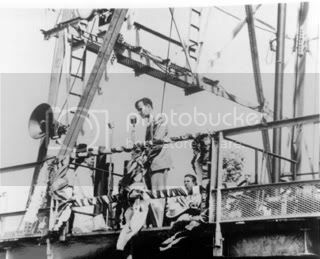 Accounts claim, that an island owned by oil man Howard Hughes in the gulf and leased by Zapata Off-Shore Drilling Company was the CIA forward operations jumping-off point in operations against Cuba. Zapata was CIA G.H.W. Bush's ("Poppy's") front company which some speculate lost a lot of CIA dollars and Oil dollars when the CIA/MIC Invasion of Cuba was stopped by JFK. CIA director Allen Dulles was fired by JFK for his brazen attempt to Invade Cuba without JFK's permission. This same man, was put in charge of the Warren Commision's final report on who killed President Kennedy! Finally, according to Cuban intelligence official Fabian Escalante in The Cuba Project: CIA Covert Operations 1959-62, Jack Crichton and George H.W. Bush raised funds for the CIA's Operation 40. Fabian Escalante was in the Department of State Security (G-2) in Cuba in 1960. At the time of the Bay of Pigs, Escalante was head of a counter-intelligence unit and was part of a team investigating a CIA operation called Sentinels of Liberty, an attempt to recruit Cubans willing to work against Castro. His information about Bush apparently comes from a counterintelligence operation against Tracy Barnes of the CIA. On January 8, 2007, newly released internal CIA documents revealed that Zapata had in fact emerged from Bush's collaboration with a covert CIA officer in the 1950s. According to a CIA internal memo dated November 29, 1975, Zapata Petroleum began in 1953 through Bush's joint efforts with Thomas J. Devine, a CIA staffer who had resigned his agency position that same year to go into private business, but who continued to work for the CIA under commercial cover. Devine would later accompany Bush to Vietnam in late 1967 as a "cleared and witting commercial asset" of the agency, acted as his informal foreign affairs advisor, and had a close relationship with him through 1975. The CIA codename for the Bay of Pigs invasion of April 1961 was "Operation Zapata". Through his work with Zapata Off-Shore, Bush is alleged to have come into contact with Felix Rodriguez, Barry Seal, Porter Goss, and E. Howard Hunt, around the time of the Bay of Pigs operation. Phillips and others have detailed subsequent involvement by Zapata associates in the Watergate affair. George Bush, as Richard Nixon's ambassador to the United Nations, allegedly urged his former Zapata partner Bill Liedtke to launder $100,000 to the White House plumbers. After Nixon's 1972 re-election, he appointed Bush as Chairman of the Republican Party National Committee. When the laundering was exposed, those involved included several CIA officials: E. Howard Hunt, Frank Sturgis, Eugenio Martínez, Virgilio González, and Bernard Barker. A discussion of the laundering appears on the Nixon tapes for June 23, 1973. Michael Maholy alleges that Zapata Off-Shore was used as part of a CIA drug-smuggling ring to pay for arming Nicaraguan Contras in 1986-1988, including Rodriguez, Eugene Hasenfus and others. Mahony claims Zapata's oil rigs were used as staging bases for drug shipments, allegedly named "Operation Whale Watch." Mahony allegedly worked for Naval Intelligence, US State Department and CIA for two decades. It appears G.H.W.Bush was in Washington the day before 911 at the Carlyle "Business Conference" with Bin Laden's Brother Shafiq bin Laden. Seems old Poppy likes to be in the same city that the hit occurs in….. It didn't help that as the World Trade Center burned on Sept. 11, 2001, the news interrupted a Carlyle business conference at the Ritz-Carlton Hotel here attended by a brother of Osama bin Laden. Former president Bush, a fellow investor, had been with him at the conference the previous day. In the documentary film Fahrenheit 911, Michael Moore makes nine allegations concerning the Carlyle Group, including: That the Bin Laden and Bush families were both connected to the Group; that following the attacks on September 11, the bin Laden family’s investments in the Carlyle Group became an embarrassment to the Carlyle Group and the family was forced to liquidate their assets with the firm; that the Carlyle group was, in essence, the 11th largest defense contractor in the United States. Moore focused on Carlyle's connections with George H. W. Bush and his Secretary of State James A. Baker III, both of whom had at times served as advisors to the firm. A Carlyle spokesman noted in 2003 that its 7% interest in defense industries was far less than several other Private equity firms. Carlyle also has provided detail on its links with the Bin Laden family, specifically the relatively minor investments by an estranged half brother. In his documentary The World According to Bush (May 2004), William Karel interviewed Frank Carlucci to discuss the presence of Shafiq bin Laden, Osama bin Laden's estranged brother, at Carlyle's annual investor conference while the September 11 attacks were occurring. Zeitgeist The Movie makes similar claims that The Carlyle Group may have played a part in 9/11. Bush-Hinckley family connections http://en.wikipedia.org/wiki/John_Hinckley,_Jr. Seen on Wkipedia on Oct 27,2009. 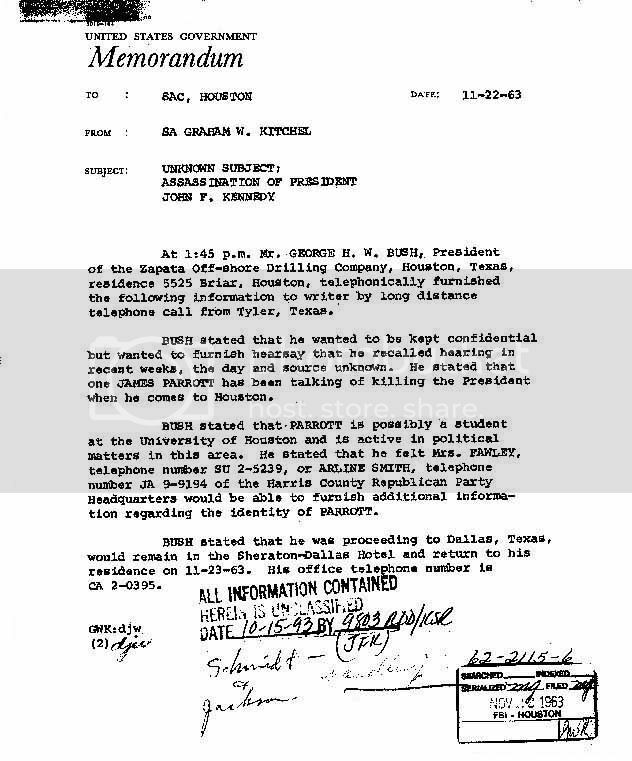 According to the March 31, 1981, edition of the Houston Post, and reported by AP, UPI, NBC News and Newsweek, Hinckley is the son of one of George H.W. Bush's political and financial supporters in his 1980 presidential primary campaign against Ronald Reagan; John Hinckley, Jr.,'s elder brother, Scott Hinckley, and Bush's son Neil Bush had a dinner appointment scheduled for the next day. “ The family of the man charged with trying to assassinate President Reagan is acquainted with the family of Vice-President George Bush and had made large contributions to his political campaign … Scott Hinckley, brother of John W. Hinckley, Jr., was to have dined tonight in Denver at the home of Neil Bush, one of the Vice-President's sons … The Houston Post said it was unable to reach Scott Hinckley, vice-president of his father's Denver-based firm, Vanderbilt Energy Corporation, for comment. Neil Bush lives in Denver, where he works for Standard Oil Company of Indiana. In 1978, Neil Bush served as campaign manager for his brother, George W. Bush, the Vice-President's eldest son, who made an unsuccessful bid for Congress. Neil lived in Lubbock, Texas, throughout much of 1978, where John Hinckley lived from 1974 through 1980. Neil Bush: (Brother of George W. Bush) Director of Siverado Savings and Loan, which collapsed taking down Lincoln S&L and throwing many S&L into insolvency. The RTC had to take over properties and banks to save the system. http://en.wikipedia.org/wiki/Savings_and_loan_crisis Seen on Wikipedia 10/27/09. Silverado Savings and Loan collapsed in 1988, costing taxpayers $1.3 billion. Neil Bush, son of then Vice President of the United States George H. W. Bush, was Director of Silverado at the time. Neil Bush was accused of giving himself a loan from Silverado, but he denied all wrongdoing. The US Office of Thrift Supervision investigated Silverado's failure and determined that Neil Bush had engaged in numerous "breaches of his fiduciary duties involving multiple conflicts of interest." Although Bush was not indicted on criminal charges, a civil action was brought against him and the other Silverado directors by the Federal Deposit Insurance Corporation; it was eventually settled out of court, with Bush paying $50,000 as part of the settlement, the Washington Post reported. Neil Bush paid a $50,000 fine and was banned from banking activities for his role in taking down Silverado, which cost taxpayers $1.3 billion. A Resolution Trust Corporation Suit against Bush and other officers of Silverado was settled in 1991 for $26.5 million. George Walker Bush (Jr.). Started Arbusto Energy (Later Harkin Energy). Allowed contracts into the Persian Gulf even though company had no experience in that part of the world. Financial partner was Salem Bin Laden. Salem lost his money in Abusto when it went bust, and had an unfortunate fatal aircraft accident in Austin Texas in 1988 according to wiki on 5/5/09 http://en.wikipedia.org/wiki/Arbusto_energy. Arbusto Energy (sometimes referred to as Arbusto Oil) was a petroleum and energy company formed in Midland, Texas, in 1977, for former US President George W. Bush by a group of investors which included Dorothy Bush, Lewis Lehrman, William Henry Draper III, Bill Gammell, and James R. Bath. The company's chief financial officer was K. Michael Conaway, now a United States Congressman from Texas. It was later revealed that Bath made an investment of $50,000 while representing Salem bin Laden of the Saudi Binladin Group. This fact became controversial after the September 11, 2001 attacks due to Salem bin Laden being an older, half-brother of Osama bin Laden, who planned and financed the attacks. Upon Salem bin Laden's death in a 1988 airplane crash, in Texas, his interest in Arbusto (along with other Binladin Group assets), passed to Khalid bin Mahfouz. In 1982, Arbusto became known as Bush Exploration, a year after George H. W. Bush became Vice President. A friend of the Bush family, Philip Uzielli, invested $1 million in 1982 in exchange for a 10% stake in the company, at a time when the whole company was valued at less than $400,000. As it neared financial collapse again in September 1984, Bush Exploration merged with Spectrum 7 Energy Corp., a company owned by William DeWitt and Mercer Reynolds. Bush became Chairman and CEO of Spectrum 7. In 1985 Spectrum 7 reported a net loss of $1.5 million and was bought in 1986 for $2.2 million by Harken Energy, with Bush joining the Harken board of directors and finance audit committee. In 1987 the Saudi investor Abdullah Taha Bakhsh bought most of Union Bank of Switzerland's shares in Harken becoming its third largest investor owning 17% of the company. He was represented on the board by Talat M. Othman. Another investor was Ghaith R. Pharaon, a partner of Bakhsh's, who would later be involved in the Bank of Credit and Commerce International scandal, and is currently the target of an international dragnet. In January 1990 with the company in the same state as its previous incarnations, it was awarded a contract to drill for crude oil off the coast of Bahrain, a move that shocked industry insiders as Harken had no previous experience outside of the US or of drilling offshore. When Time magazine announced this merger in its December 22, 1930 issue, they noted that of the company's 16 founding partners a total of 11 were graduates from Yale University. Eight of the ten initial partners (all except Moreau Delano and Thatcher Brown) were members of Skull and Bones. The new firm shifted its emphasis from investment banking to commercial banking, investment advisory services and custody. In 2003, the company's headquarters moved from 59 Wall Street, which it had built and occupied since the 1920s, to the Marine Midland Building at 140 Broadway. From Wikipedia, the free encyclopedia http://en.wikipedia.org/wiki/Russell_Trust_Association Seen on Wikipedia seen on 10/28/09. The Russell Trust Association is the business name for the New Haven, Connecticut based Skull and Bones society, incorporated in 1856. The Russell Trust was incorporated by William Huntington Russell as its president, and Daniel Coit Gilman as its first treasurer. Gilman later went on to become president of the University of California at Berkeley and Johns Hopkins University before leaving to become the first president of the Carnegie Foundation. Gilman also served as one of the first board members of the Russell Sage Foundation. Gilman's summer home in Maine is listed as a National Historic Landmark. In 1943, by special act of the Connecticut state legislature, its trustees were granted an exemption from filing corporate reports with the Secretary of State, which is normally a requirement. From 1978 onward, business of the Russell Trust Association was handled by its single trustee, Brown Brothers Harriman & Co. partner John B. Madden. Madden started with Brown Brothers Harriman in 1946, under senior partner Prescott Bush, George H.W. Bush's father. On its 2004 Form 990, the Russell Trust Association reported $3,205,143 in net assets. The business and political network of the Skull and Bones is well detailed by Hoover Institution scholar Antony C. Sutton in the exposé, America's Secret Establishment. Social organizations connected to the Russell Trust covert activities network include Deer Island Club, which also operate as a corporation. When I return, we will continue with Kellogg Brown and Root which I think it morphed into, and many of the wars for profit this group has been involved with. What stands out is a pattern of over-billing the taxpayer in a system of outsourcing and no-bidd contracts. As voters and taxpayers, we have a say in how this government spends and conducts it's affairs. We must never give up our right to discuss and comment on information that is in the public domain. Clarke, James W. (1990). On Being Mad or Merely Angry: John W. Hinckley, Jr., and Other Dangerous People. Princeton University Press. Hinckley, John W. "The Insanity Defense and Me". Newsweek, September 20, 1982. ^ a b c The American Experience - John Hinckley Jr by Julie Wolf. Retrieved March 5, 2006. ^ Taxi Driver: Its Influence on John Hinckley, Jr.
^ Letter written to Jodie Foster by John Hinckley, Jr., March 30, 1981. ^ The Gun: A Saturday Night Special From Miami, by Pete Earley, Washington Post, March 31, 1981. Retrieved February 28, 2007. ^ Guns Traced in 16 Minutes to Pawn Shop in Dallas, Charles Mohr, New York Times, April 1, 1981. Retrieved February 28, 2007. ^ Pete Barley and Charles Babcock (1981-04-04). "The Exploding Bullets". The Washington Post. Retrieved 2007-02-28. ^ Reagan, Ronald (Reagan said this on January 11, 1990. The episode of Larry King aired on March 30, 2001. 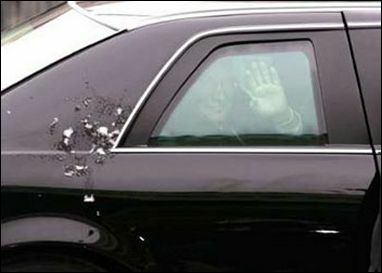 ), Larry King Live: Remembering the Assassination Attempt on Ronald Reagan, retrieved November 13, 2008. ^ Jim Brady, 25 Years Later, CBS News Exclusive: Reagan Aide And Wife Reflect On Life Since Shooting - CBS News. ^ a b c d The Trial of John W. Hinckley, Jr., by Doug Linder. 2001 Retrieved March 10, 2007. ^ The John Hinckley Trial & Its Effect on the Insanity Defense by Kimberly Collins, Gabe Hinkebein, and Staci Schorgl. ^ "Barring ultimate issue testimony". Springerlink. Retrieved 2007-10-25. ^ Hinckley Hails 'Historical' Shooting To Win Love by Stuart Taylor, Jr. New York Times. July 9, 1982. Retrieved March 21, 2007. ^ Life at St. Elizabeths by Denise Noe. Crime Library. Courtroom Television Network, LLC. Retrieved April 15, 2007.